The Psychologist recently asked whether we are ‘yawning at the apocalypse’. It’s a charge that could be levelled at the music world, too. Like psychologists and psychotherapists, musicians can find it hard to move between the micro and the macro. For the latter, of course, Michael Jackson’s ‘Earth Song’ may serve as an eternal warning not to even dare try. But Gazelle Twin, aka dark electronic artist Elizabeth Bernholz, isn’t yawning at the apocalypse. She’s screaming. More specifically, she’s screaming with startling vocal prowess over distorted industrial beats, while dressed as a nightmarish court jester in matching red Adidas Gazelles. Behind her on stage is a painted picture-postcard scene of a verdant riverbank. Yet the gig opens with the nauseating sound of buzzing flies, and ends with a warning that the river is overflowing. Inbetween tracks, she fixes her mouth – the only part of her face visible through the costume – into a jeering, rictus grin. Performing live at her alma mater, Sussex University, Bernholz sometimes lets rip with her searingly beautiful, classically trained soprano. But more often her voice fragments, via digital manipulation, into a sinister chorus of multi-gender voices that rant and hector and spew tabloid bigotry. ‘Much better in my day, much better in my day, much better in my day/No locked doors no foreigners’ she whispers with increasing frenzy on ‘Better in My Day’. ‘Wave those flags, stick it to the man, my little island’ she hisses insidiously on ‘My Little Lamb’. ‘Throne’ finds her intoning ‘insolvency’ with a voice more suited to high mass, while ‘Tea Rooms’ sees cosy country living onto which tones of pitch-warped existential dread are superimposed. The whole performance sounds like a demonic message hidden in civilisation’s runout groove. And then there’s the recorder. 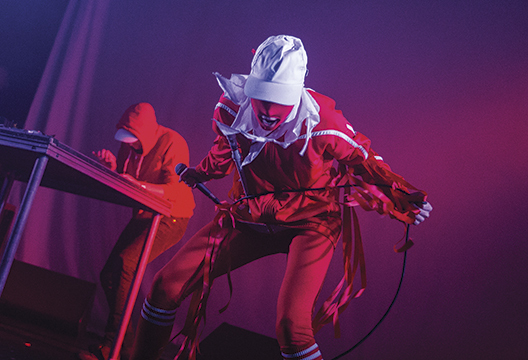 Abrasive techno and unsettled electronica are Gazelle Twin’s stock in trade. For Pastoral, she’s worked in tropes from early music and traditional English song, giving her vision of contemporary Britain a warped folk horror flavour. The recorder hangs round her neck like an absurd anachronism as the harsh beats pound. As she plays it, she dances a grotesque caper, red ribbons flailing from the elbows of her jester’s costume. It was, I think, the way she embodied both the vulnerable schoolgirl and the powerful aggressor, the everyday and the dread-filled, that made her previous live performances so powerfully unsettling. For Pastoral, Gazelle Twin has created a persona that is more contrivedly theatrical, less compellingly uncanny. - Reviewed by Isobel Todd, a psychodynamic counsellor and music/arts journalist based in Brighton.